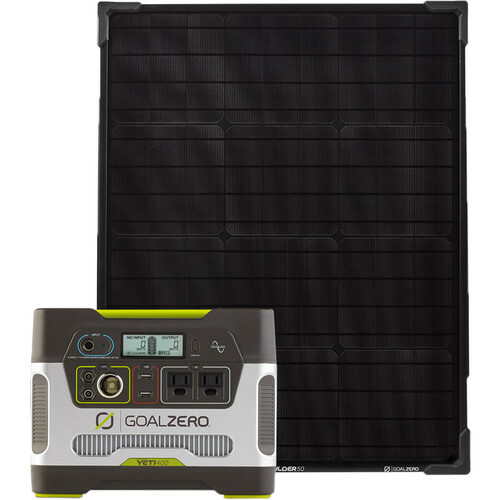 Whether you're off the grid or the power's out, the Yeti 400 Portable Power Station & Boulder 50 Solar Panel Kit from Goal Zero gives you a way to power your electronic devices. An environmentally-friendly alternative to generators, the Yeti 400 utilizes a 396Wh, 12V, 33Ah lead-acid battery. The Boulder 50 delivers 50 watts of electricity under optimal conditions to charge the Yeti. Whether you are in the woods, on the jobsite, or dealing with a power outage, the Yeti 400 Solar Generator Power Pack from GoalZero is a solid choice to power your small electronics. This power pack is an environmentally-friendly alternative to traditional back-up generators. It utilizes a 396Wh AGM lead acid battery that can charge devices from smart phones and laptops. Since it uses a deep cycle battery, it works without noise and produces no exhaust. The Yeti can be charged from 110VDC house current, 12 VDC car/vehicle power or from compatible GoalZero solar panels. The front display panel provides readouts of incoming and outgoing power, and battery status in 20% increments. This real-time feedback enables precise power management. The Yeti provides an array of output options for any energy need. It has two standard 110VAC grounded wall plugs, two standard USB ports, a 12VDC car/vehicle port and two 6mm 12VDC plug ports. For additional battery power, the Yeti is chainable with other units. The battery is removable, so it can be upgraded or replaced as needed. Use the clean, free and renewable power of the sun to charge your Goal Zero portable power pack with the Boulder 50 Solar Panel. This 21.75 x 26.75 x 1.75" panel produces up to 50 watts of power that can be stored in any Goal Zero recharger; it is most effective with the Yeti 150, Yeti 400, Yeti 1250, Yeti 1400, Sherpa 50 and Sherpa 100 models. You can chain up to four Boulder 50s together for increased power production. The Boulder 50 can also be chained with other models in the Boulder line. The panel is covered with scratch-resistant tempered glass and is supported by an aluminum frame with extra corner protection, and features an integrated kickstand that supports it at the optimum angle for charging. The weather-resistant Boulder 50 is rugged enough to be permanently installed, but its size and 12.4-pound weight also make it portable. Box Dimensions (LxWxH) 13.78 x 12.835 x 11.811"
Box Dimensions (LxWxH) 29.1 x 23.3 x 4.4"
In the height of day. How long would the battery take to charge full with solar pannel? Boulder 30 Solar Panel: 26-52 hours. So with the included Boulder 50 probably closer to 18 to 40 hours.